A UN panel will likely point out that Seoul violated international sanctions by delivering refined oil products to an inter-Korean liaison office in North Korea without notifying the Security Council, Kyodo News reported Thursday. The Panel of Experts is expected to submit a draft report to the UN Security Council Sanctions Committee on North Korea in early February. When the National Assembly and Korean media took issue with an unauthorized delivery of diesel fuel to the liaison office in the border town of Kaesong, the Unification Ministry denied it was subject to sanctions. 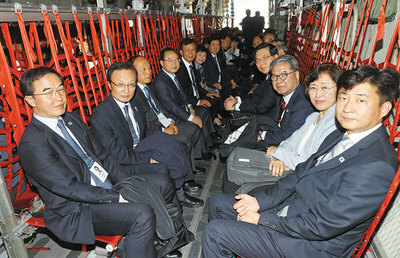 It said the fuel was intended for South Korean personnel and provided no economic benefit to the North. But Kyodo said Seoul "did not notify the Security Council of its deliveries of petroleum products" and the UN panel will point out that this was "in breach of international sanctions." In a resolution in December 2017, the UNSC set the annual cap on petroleum shipments to the North at 500,000 barrels and made it mandatory for member states to report any shipments to the UN. Seoul has never clarified whether it consulted the UNSC over fuel deliveries, whether or not they violate sanctions. "It's up to the UNSC to decide whether a certain country has violated sanctions," a diplomatic source here said. "If Seoul reached the conclusion unilaterally it's a big problem." But Foreign Ministry spokesman Noh Kyu-duk told reporters the government used the refined oil products "only for the purpose of implementing inter-Korean exchange and cooperation projects and brought leftovers back" to South Korea. "We made preparations for the opening of the liaison office on the principle of complying with the framework for sanctions." The two Koreas set up the liaison office last September under an agreement reached in between their two leaders in April. Seoul shipped about 340 tons of fuel to the North to get the generators running.